RUSH: The Israeli prime minister, Benjamin Netanyahu, just finished a presentation in which he revealed that the Iranians are indeed cheating on the nuke deal. He revealed Iranian nuclear designs, blueprints, spreadsheets as he revealed new dramatic intelligence on Monday which Netanyahu claimed shows Iran is brazenly lying about its nuclear weapons program and that the country is not complying with the deal it signed in 2015. You know, I love the use of the word “claimed.” The Drive-Bys, that is a word they use to signify that they don’t believe what they’re being told. So in the case of Netanyahu, Netanyahu claims to have and claims to say and claims to point out that the Iranians are cheating on the nuke deal. Rather than just, “Today Israeli prime minister Benjamin Netanyahu presented evidence that which has forced him to conclude the Iranians are cheating on the…” No, no, no, no. “Today Israeli Prime Minister Netanyahu claimed.” Typical, typical Drive-By Media trick. This is one powerful presentation by @netanyahu. Anyone who doesn’t think Iran was lying and still is lying doesn’t know Iran. 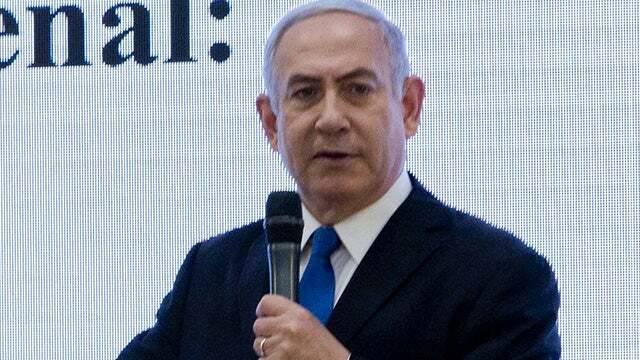 RUSH: Ari Fleischer, who was the former press secretary for George W. Bush, after seeing the Netanyahu presentation, tweeted: “This is one powerful presentation by Netanyahu. Anybody who doesn’t think Iranian was lying and still is lying doesn’t know Iran.” But wait, but wait. Obama said it was a deal the world couldn’t refuse! Trump has been out saying the same thing that Netanyahu said. We have some sound bites from Netanyahu. We’ll start here with number 27. It’s in Tel Aviv, and Netanyahu is conducting this presentation demonstrating how Iran lied after signing the nuclear agreement. NETANYAHU: A few weeks ago in a great intelligence achievement, Israel obtained half a ton of the material inside these vaults. And here’s what we got: 55,000 pages, another 55,000 files on 183 CDs. Everything you’re about to see is an exact copy of the original Iranian material. Here’s what the files included. Incriminating documents, incriminating charts, incriminating presentations, incriminating blueprints, incriminating photos, incriminating videos, and more. We’ve known for years that Iran had a secret nuclear weapons program called Project Ahmad. We can now prove that Project Ahmad was a comprehensive program to design, build, and test nuclear weapons. RUSH: Netanyahu says that the Israelis have now gotten hold of half a ton of documents! Half a ton of Iranian documents! Every time I see something, I am so glad I don’t write anything down. I got to thinking, Brian, you’d be interested. If, at the end of this illustrious broadcast career, can you imagine the Rush Limbaugh broadcast library, like there are presidential libraries? There’s nothing to put in it document-wise. I’m amazed. Presidential libraries have these tens of thousands of documents and stuff. I just have never taken these kinds of notes on anything. Half a ton of Iranian documents for their nuclear weapons program. Here’s the next sound bite we have from Netanyahu. NETANYAHU: This was a secret underground enrichment facility that the Iranians built under a mountain. You don’t put thousands of centrifuges under a mountain to produce medical isotopes. You put them for one reason: nuclear weapons. Here’s an original Iranian blueprint of Fordow. And what happened was Iran continued to build Fordow years, secretly build it years after Project Ahmad ended. Here’s what it looks like. That’s the entrance. It goes under a mountain. You also will be not surprised that Iran insisted on keeping Fordow. And amazingly, the nuclear deal enabled them to do it. RUSH: I’m not surprised. Folks, this is not brain science here, rocket science. Obama himself was the one saying that we’ve got no right to tell the Iranians what they can and can’t do with nuclear weapons. Nobody told us. Who are we to tell the Iranians what they can and can’t do? “So then why did you do the deal, Mr. Obama?” Well, we wanted to limit their ability, make sure they couldn’t use nuclear weapons for 10 or 15 years, but we don’t have the right to stop them. And so in the process, Obama signifying that he has no concept of good guys and bad guys and certainly not the U.S. as the good guys. And certainly — and don’t doubt me on this — there’s no way Obama and anybody in his confederation, there’s nobody that believes the United States has moral authority in things like this, because we’re too tainted by our own illegitimate founding to have moral authority over anything, including freedom, leadership, and the like. Here’s the final Netanyahu bite. 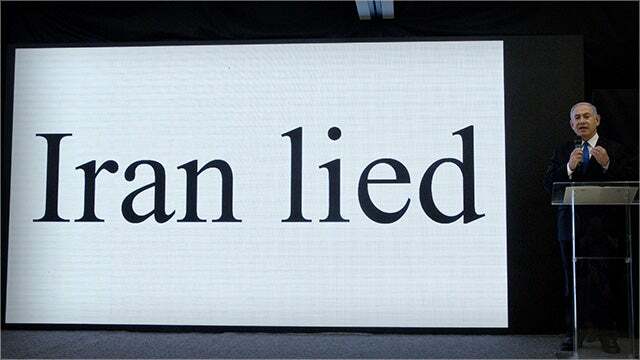 NETANYAHU: The Iran deal, the nuclear deal, is based on lies. It’s based on Iranian lies and Iranian deception. A hundred thousand files right here prove that they lied. In a few days’ time, President Trump will decide, will make a decision on what to do with the nuclear deal. I’m sure he’ll do the right thing, the right thing for the United States, the right thing for Israel, and the right thing for the peace of the world. RUSH: I’ll tell you, you need to see what Netanyahu did. It was like a classroom presentation, visual aids, photos, charts, graphs, all of this, spreadsheets. He’s not just up there saying we got half a ton of documents. He’s showing some of the documents. They’ve got all these files on various media forms: CD, thumb drive, DVD, what have you.